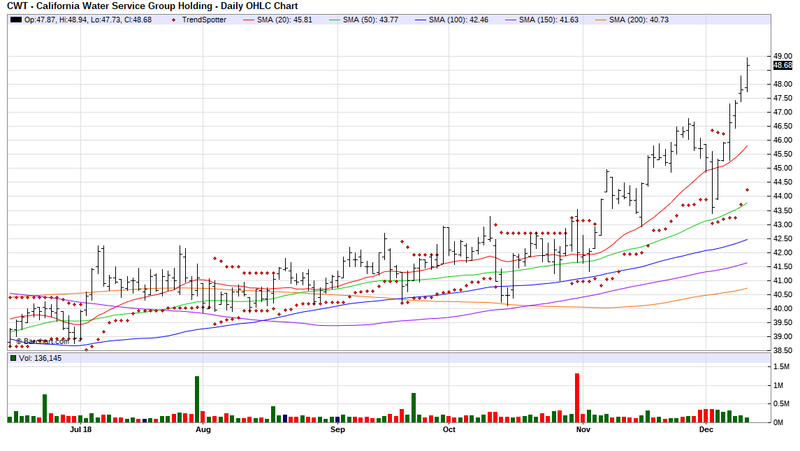 The Barchart Chart of the Day belongs to the water utility company California Water Services Group (CWT). I found the stock by sorting Barchart's Top Stocks to Own list first by the most frequent number of new highs in the last month, then I used the Flipchart feature to review the charts for consistent price appreciation. Since the Trend Spotter signaled a buy on 12/10 the stock gained 3.92%. California Water Service Group is the publicly traded water utility in the United States, providing high- quality utility services to the millions of people in the communities through six subsidiaries: California Water Service (Cal Water), Hawaii Water Ser vice Company, Inc. (Hawaii Water), New Mexico Water Service Company (New Mexico Water), Washington Water Ser vice Company (Washington Water), CWS Utility Services (CWSUS), and HWS Utility Services (HWSUS). Cal Water, Hawaii Water, New Mexico Water, and Washington Water provide regulated water and wastewater utility services, while CWSUS and HWSUS conduct the Company's non-regulated business, which includes providing billing, water quality testing, and water and wastewater system operations and management services to cities and other companies. Disclosure: I am/we are long CWT.